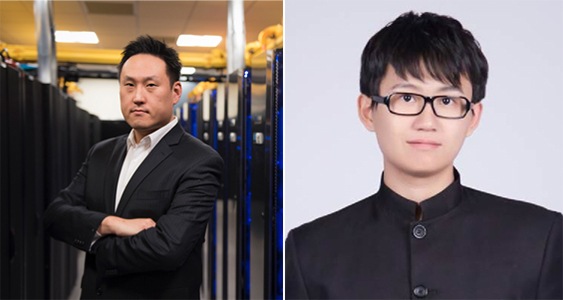 Shuaiwen Leon Song (l) and Ang Li (r) wered honored by HiPEAC for their work on a novel clustering technique, the “CTA Clustering” framework, that automatically exploits inter-cooperative thread array locality for general applications. Enlarge Image. Notably, “Locality-Aware CTA Clustering for Modern GPUs,” which describes the concept, method, and design for an inter-cooperative thread array (CTA) clustering framework that automatically exploits inter-CTA locality for general applications, was the first paper led by a Department of Energy national laboratory—and the first-ever from PNNL—to be accepted by ASPLOS since its inception in 1982. Li, who served as the lead author, and Song were joined in the effort by an international mix of colleagues from the College of William and Mary (Virginia), as well as Technische Universitat Dresden (Germany), University of Copenhagen (Denmark), and Eindhoven University of Technology (The Netherlands). 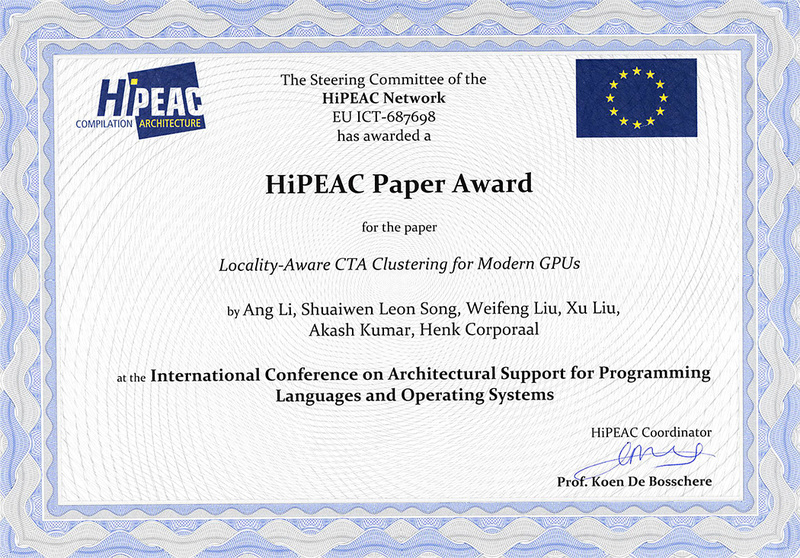 The HiPEAC award is part of the organization’s mission “to steer and increase the European research in the area of high-performance and embedded computing systems.” Explicitly, these awards are aimed to highlight HiPEAC members to “publish their work at conferences in which Europe is not strongly represented,” including ASPLOS.